Mr Hayden came to World First Travel Insurance having had a really distressing time trying to buy travel insurance for his family which would provide cover for his 10 year old son who has epilepsy. Speaking to other companies it felt as if little regard was given to their individual circumstances, that an anonymous uncaring representative just read questions from a tick list that border on being discriminatory. At the end of the call they would either refuse him insurance or it was really expensive. Word searching 'epilepsy and travel insurance' Mr Hayden came across World First. He decided to give us a call. His experience could not be a greater contrast. He spoke to an advisor who was, in his words, "absolutely fantastic, really understanding and very helpful." Mr Hayden was absolutely delighted when World First could offer a single trip policy for the family of two adults and two children, for seven days in Europe which included cover for his son's pre-existing medical condition, for just £61.83. Mr Hayden concludes, "We had a great holiday in Portugal with full peace of mind about our travel cover. I would wholeheartedly recommend World First to anyone. The kids really want to go skiing next year and we'll go straight back to World First for our travel insurance." 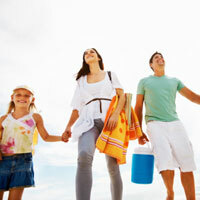 Use this resource to find out more about epilepsy travel insurance.